I just hope those praying will do so with knowledge, so it doesn't end up an effort in futility. Prayer works better when certain conditions are met. Many are looking forward to a positive outcome for the Governor. The storm raised by the troubling politicking over the APC party nomination for the Governorship of Lagos State in the 2019 polls continues to rage unabated, and unlikely to dissipate any time soon. Before anyone, however, can hazard a guess on how the saga will likely end, it is prudent that he visits Epe, the hometown of the incumbent, Governor Akinwunmi Ambode. The mood in Epe – a town gripped by tension - is fever pitch. The people’s sentiment is at boiling point. In rallying for its own, people of Epe town have gone ballistic spiritually to quell the tempest threatening to bring to a halt the upward trajectory of their rising son. Gov. Ambode is presently battling an internal wrangling within his party that has resulted in the emergence of two other APC stalwarts, Mr Babajide Sanwo-Olu and Mr Obafemi Hamzat, who have both signified their interest in slugging it out with him at the party’s primary for the APC governorship ticket in Lagos State. The emergence of the duo followed a rumoured frosty relationship between Ambode and APC National Leader, Asiwaju Bola Tinubu, who hitherto was regarded as his political godfather and mentor. While cloak-and-dagger maneuverings continue to play out in the party, the people of Epe have moved the fight to a spiritual level as they embark on combative prayers to dismantle the various forces arraying against the embattled governor. While tension is rising in the political firmament of the centre of excellence, a group of APC elders called the Governor’s Advisory Council, GAC dominated mainly by Tinubu’s trusted allies, will today at a scheduled meeting in Ikeja take a final position on who the party will present to the public for support in the 2019 polls. The body had met on Tuesday to consider pleas and various interventions from different groups and prominent individuals to consider Ambode for a second term. The meeting however ended without a definite answer to the embattled governor. One of the decisions taken at the Tuesday meeting was that the governor will not be allowed to sit in today’s meeting when the party elders will decide his fate. With this, today’s meeting may just be a mere ceremony to say a capital NO to the governor as majority of those who will attend the event are already bitter against Ambode and have not hidden their opposition to his style of governance and bid for a second term. Daily Sun visited Epe on September 18, 2018, and found a town that was to a large extent a cauldron of anger. Right from the park, various gatherings - of Okada riders, free readers at newsstands and traders - were engaged in animated discussions and heated debates that centred on Governor Ambode’s current political travails. That was not surprising, given that the governor has proven himself as an illustrious son of the soil, having brought remarkable infrastructural development to Epe, a community that was hitherto an economic backwater. Daily Sun’s survey of suburbs like Noforija, Odomola, Ketu-Epe, and Odoragunshen turned up facts that indicated that the Ambode issue is close to the heart of many residents. The fervour devoted to the issue leaves no one in doubt that anyone in opposition to the governor is up against a whole town. The town roiled with solidarity for the governor. In the prevailing “We against Them” aura, a majority of the Epe folks envisaged themselves battling against Lagos forces trying to undo their son’s progress. A major development has been a rare show of unity between Christians and Muslims, who set aside their religious differences and joined forces together in daily prayers of intercession and vigil for Gov. Ambode at the Saint Michael Anglican Church, which is the governor’s family place of worship. The over 100-year-old church at Popo-Oba Street has assembled a 21-man prayer warrior team. In no time, the team has since been joined by a host of volunteers, both Christians (from other denominations) and some Muslims. Findings by Daily Sun showed that the team holds some of its prayer sessions for the governor on a large expanse of land opposite the church. During a visit to the church, some of the volunteers were sighted sitting on white plastic chairs on the land across from the church. In their response to questions from Saturday Sun , they all spoke in unison about their commitment to the “Save Ambode Prayer” project. A cleric of the church who spoke on condition of anonymity confirmed that intercessory prayers are being held for Gov. Ambode. He vowed that the daily vigil and prayer session would not stop until Ambode’s second term ticket is guaranteed by APC. “It is true that this church is coordinating series of prayers for Gov. Ambode. What we are doing is not evil. We have no regret over it,” he declared. Asked why the governor’s issue is dear to the church, the cleric fired back: “Gov. Ambode and his family are part and parcel of this church. Although Gov. Ambode himself is no longer a member of the Anglican Church, when he was young, he used to worship with us here with his parents. He said further: “Before he assumed office in 2015, Epe was in darkness. Not only that, the town had no good roads, and other infrastructural facilities were lacking. I know what I’m saying. I have been working in Epe and its suburbs for a long time. The cleric delivered a parting shot thus: “Let me, however, state this categorically. There are talks about some individuals and groups. There are those mentioning that one group called Mandate has sealed the fate of Ambode and that he is a goner. 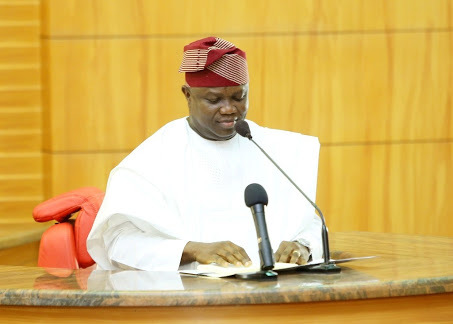 Daily Sun investigations reveal that the prayer group, as part of its activities usually go round the church seven times in the night – an allusion to Joshua’s military maneuvering in the Bible – praying aloud that the God that pulled down the walls of Jericho should pull down all the walls of Jericho threatening Ambode’s second term ambition. While leaving the church to move to another part of the town, Saturday Sun ran into a rally organized by artisans and Okada riders in support of Ambode. The spokesman for the group, Adetayo Adedayo who also doubles as chairman of the cyclists riders group, explained the drive behind their action. “Nobody is sponsoring us,” he affirmed. “Even Gov. Ambode is not aware of this rally. We are supporting him for a second term because he is from Epe. Everybody in Epe and environs support the governor 100 per cent for turning Epe and its suburbs into Small London.” For him, the governor has done a lot for Epe. “The people of Epe will not take kindly to any attempt to humiliate or deny him the second term ticket,” Adedayo declared. Septuagenarians Alhaji Yeeken Dairo and Alhaja Taibat Akingbehin at Oke-Balogun Street and Imokun Street respectively echoed similar sentiments. Dairo, community leader of Imokun LCDA, appealed directly to the good nature of Asiwaju Tinubu to forgive Ambode his perceived sins. Najeem Quadri, a baker, tackled APC leadership and Tinubu directly. Once more, Quadri raved at Tinubu and others, whom he described as greedy. “Did Tinubu not serve two terms? Did Fashola not serve two terms? Now they are deciding another man’s fate. Tinubu and his co-conspirators in APC should know that God will also decide their own fate,” he said. He resented the idea of anyone begging Tinubu to endorse Ambode for a second term. “They should leave him to God,” he declared. Another respondent who spoke with Daily Sun , Otunba Maruphdeen Babatunde Abdulrahman, urged Gov. Ambode not to surrender. “Whether Tinubu or people in his camp like it or not, if Allah has ordained Ambode for a second term, no individual can do anything against it,” he quipped.